Turn the freezer to the coldest setting a few hours before making the sorbet. Using a peeler, pare several wide strips of peel from the washed orange, taking care not to include any white pith. Place in a heatproof bowl with the sugar. Add 600ml boiling water and stir until the sugar has dissolved. Leave until cold. Remove the orange peel from the syrup, then stir in the Campari. Pour into a freezerproof plastic container and place in the freezer for 3 hours, until the sorbet has frozen about 3cm in from the edges. Break down the sorbet using a hand or electric whisk until smooth. Return to the freezer for 1 hour, then whisk again. Repeat this process an hour later, then leave to freeze until firm. Serve in scoops with a little extra Campari poured over the top. the flavour of this sorbet will diminish with prolonged freezing, so serve it freshly made or within 2 weeks of making. 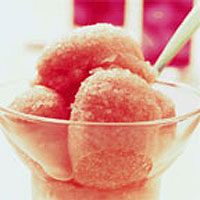 for a long, cold drink, place a scoopful of Campari sorbet in a tall glass and pour soda or lemonade over the top.